Classic Prawn and vegetable rice recipe that has the unique flavor of sauces and vegetables combined in with the shrimp. 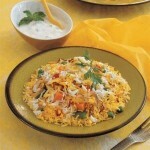 A hot and spicy dish that makes a great accompaniment for exotic curries. A delicious combo of chicken, eggs and rice. A beautiful and quick blend of rice, chicken and green peas.